Retail stores of all kinds, whether located in an outlet mall, a strip mall, a traditional mall or as a stand-alone business building, always need to think about curb appeal, safety and accessibility for their customers. This is why we recommend that business owners not forget to stay on a regular schedule for asphalt maintenance for retail stores and outlets. Espina Paving understands that parking lots are of major importance for these businesses and that it is critical to keep you open for business with minimal downtime while providing a smooth, safe surface at all times for your customers and employees. New Asphalt Construction—If you are just starting up a new retail business, you may need to have a completely new parking lot constructed. 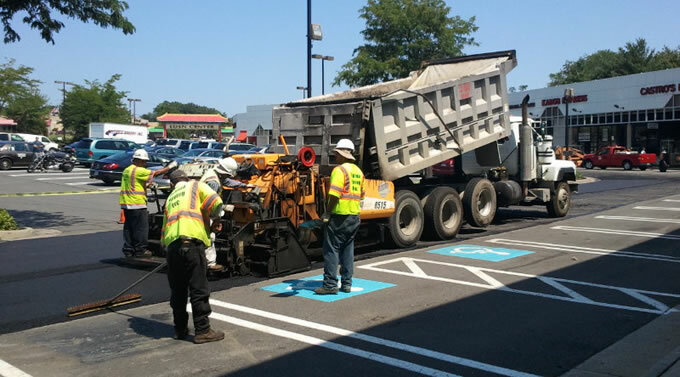 Asphalt Overlays—If you are improving an existing retail parking lot property, it may be wise to lay down a new layer of asphalt over an older one. We can do this if the existing asphalt has a strong foundation with flaws. We thoroughly patch any flaws before applying the overlay. Asphalt Overly with Fabric—To significantly extend the life of your retail parking lot, Espina Paving can include a layer of paving fabric between the milled, patched, cleaned older layer and the new layer. This fabric layer prevents deformities from making their way to the surface and is a very popular aspect of our asphalt maintenance for retail stores and outlets. Sealcoating—Heavy traffic, oil and other automotive fluid leaks, rain, snow, ice, snow-removal crews, debris, etc. all take a toll on retail parking lots over time. Regularly sealcoating your asphalt pavement every 2-3 years can drastically reduce asphalt repair costs and keep your storefront looking great. Asphalt patching and repairs to full replacements—It is important for you to regularly survey the condition of your parking lot to proactively and quickly catch any cracks, intrusion of tree roots or weeds, potholes, ponding and drainage problems, etc. These not only detract from the overall appearance of your storefront, but they can even cause safety issues and lead to more expensive problems later on. If you notice any of these problems in your asphalt paved areas, call Espina Paving for an evaluation and estimate. The faster damage can be addressed, the less expensive and time consuming it will be to fix, which means less downtime for you, your employees and your customers. Espina Paving uses the latest in paving technology and green paving techniques to help businesses with their asphalt maintenance for retail stores and outlets needs. We are committed to helping you keep all of your asphalt paved areas in great shape. This will help your business save money in repair costs, insurance and legal costs, and we can even help your parking areas go easier on the environment. Contact Espina Paving today at (703) 491-9100 to ask about our services and ask about any asphalt paving questions you have.